Hammer and Tongue returns from its summer break on Thursday evening and we’ve got a very special night in store. Our headliner is Ross Sutherland who will perform the entirety of his new show, Stand By For Tape Backup. 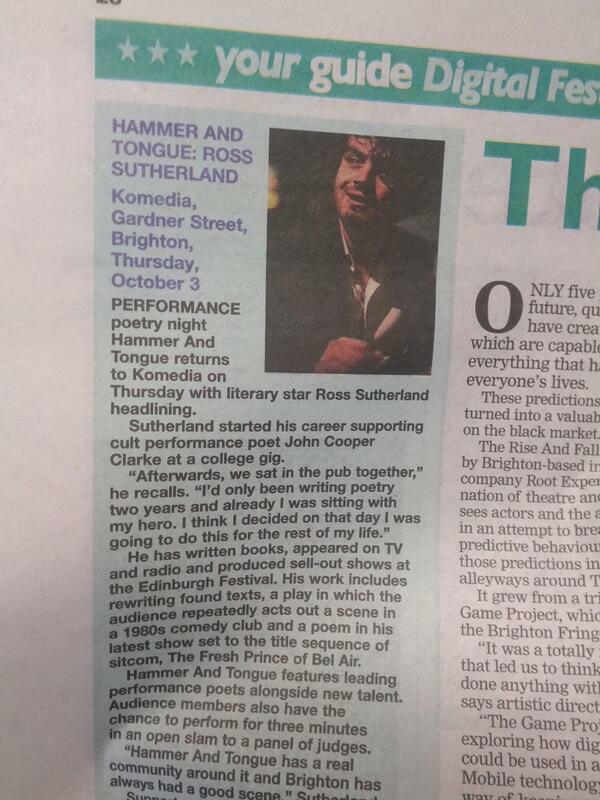 Ross is probably my favourite poet (well, non-Brighton poet, anyway). I love his first collection, Things to do Before you Leave Town, which is published by the fantastic Penned in the Margins press – you should listen to the title poem now. I saw Stand By For Tape Backup at Latitude in July. Ross used to watch TV with his grandfather and found an old video tape containing some of the shows they used to enjoy. As the video plays, Ross recites an amazing monologue, synchronising perfectly with the video. Among the films and shows excerpted are the Wizard of Oz, Thriller, and a lovely sequence on the true story of the Fresh Prince of Bel Air. The show is one of the best pieces of spoken word I’ve ever seen and we’re very lucky to be able to have it at Hammer and Tongue. Doors open at 7:30pm in Brighton Komedia’s studio bar, entry £5. You must come! hi — i missed your talk at catalyst club — or have i mistaken you for someone else?